Hints, tips, tutorials and resources. Want to know the secret that generates more revenue from email marketing? Many marketers assume that driving more leads can help them generate more sales and revenue. While increasing the size of your email list should be a top priority, your leads are worthless unless they’re qualified enough to make a purchase. Driving more qualified leads is the secret to generating more revenue from email marketing. In this article, we’ll show you everything you need to know about lead quality and how to measure it. Lead quality is a factor that allows you to identify how likely your prospects are to become your paying customers. The higher the quality of your leads, the more likely they become your customers. Exact measurements of lead quality may vary depending upon your lead generation strategy and the products you sell. However, there are a few methods to determine whether a prospect is right for your business. People download your lead magnet that is part of your marketing or sales funnel. Visitors contact your sales team to ask pre-sale questions. Leads browse through various product pages or pricing page, meaning they could be thinking of doing a business with you. How to Measure the Lead Quality? Tracking downloads on your website is easy with MonsterInsights. All you need to do is to install and activate the MonsterInsights plugin. File download tracking works out of the box without any further configuration. To find how many times visitors download your lead magnet, simply look at your events report in Google Analytics. 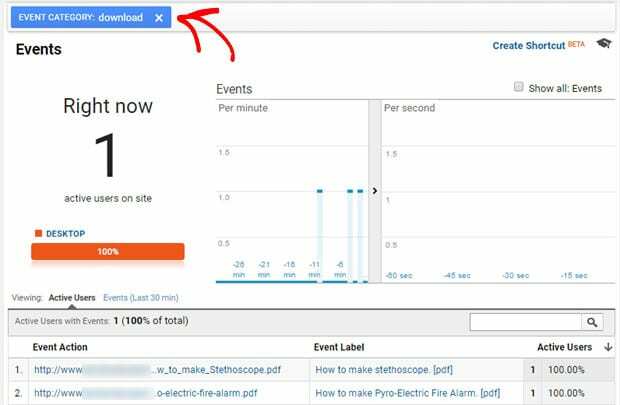 For more details, read how to track and view file downloads in Google Analytics. In addition to measuring lead quality in Google Analytics, you might also want to tag or segment your qualified leads in your email marketing tool. Identifying the quality of your leads is an essential step in lead nurturing. This way you can send emails that are more likely to be opened and engaged. Read 50 smart ways to segment your email list like a pro. To track presale query form submission, just install and activate the MonsterInsights Forms addon. If you’re using WPForms, you can even automatically add your users to your email list by including a checkbox to your contact form. Read more about form submissions tracking. By setting up Google Analytics goals, you can track whether your visitors are browsing through important pages on your site. By visiting important pages on your site, your visitors are showing an interest in your offer, which makes them qualified. And once identified a lead as qualified, you can target them onsite and offsite to show personalized marketing messages. Below are a few ways you can target your qualified leads on various marketing channels. Onsite retargeting: With OptinMonster’s onsite retargeting feature, you can show personalized marketing campaigns using popups, slide-ins, floating bar, etc. to your qualified leads that are proven to convert. Remarketing: Target your qualified leads on Facebook through remarketing campaigns to convert them into paying customers. We hope this article gives you some insights into tracking the quality of your leads. If you liked this article, you might also read how to find your most profitable email campaigns. And don’t forget to follow us on Twitter and Facebook for more Google Analytics tutorials. Google Analytics Goals vs. Events – Which One Should You be Using? MonsterInsights is Trusted by Over 2 Million Businesses Worldwide. Copyright © 2013 - 2019 MonsterInsights, LLC. MonsterInsights™ is a trademark MonsterInsights, LLC.